Kate at Maternity Glow is sharing her tips about how to get into the kitchen with your kids. I can’t think of a better way to teach your child about eating well, right from the start, than to involve them in the cooking process. While it can be messy and time consuming, kids love helping prep food, mix bowls, get down and dirty, and assist you every step of the way—including getting to taste their creation. Cooking with your child also opens up the door for communication. Think of it as a chance to spend quality time together, working as a team, and exchanging lots of dialogue. Your little one will also become more proficient with following directions, and it teaches them a useful skill they will use for the rest of their lives. 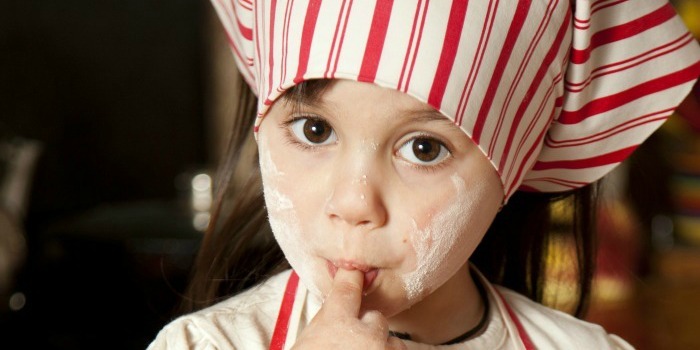 Here are seven tips to consider when cooking with your toddler! This post contains affiliate links. Most likely, your toddler is going to make a mess. It’s inevitable! So, put off cleaning your kitchen until after cooking your meal or snack (I once found batter on my ceiling). And, be sure to dress them in play clothes that are ok to get gunked up. I have even put one of my child’s art smocks over them so I didn’t have to even dirty my son’s play clothes. I also find that it’s helpful to have a bucket of soapy water and wash cloths on hand, or even a package of baby wipes to use for damage control as the cooking is underway. Toddlers have a short attention span. And, they also aren’t known for their patience. So it’s a good idea to lay out all of your materials before your child even enters the kitchen. This will require you to go through every step of the recipe in your head, and having all of the bowls, spoons, ingredients, and measuring cups in place. I like to use my island and have everything set out in order for added ease. When it comes to cooking in the kitchen, I really don’t like to just wing it. As mentioned, most toddlers are not going to sit and wait for you to look up a recipe, let alone gather your ingredients. So pick out a recipe in advance so you can also make sure you have all of the ingredients in stock, as well. I learned the hard way when I didn’t plan ahead and had to make a quick run out to the store. Needless to say, my toddler was not amused, was completely impatient, and even uninterested as soon as we got back home. When it comes to having your toddler help you in the kitchen, it all boils down to their motor skills. Very young children may have a difficult time gripping objects, spreading, rolling, or mixing. So, it’s best to search for a recipe that really complements their developmental stage. There are a number of cooking utensils that are designed just for toddler chefs. I have a set of nylon knives that are not sharp to the touch, but can cut through objects with ease. Certain tools and utensils also have easy to grip handles, which are perfect for little helping hands. I even purchased my son a set of his own measuring cups, silicone prep bowls, and his own wooden spoons (designed in a smaller, shorter size) to help me mix batters. Keep in mind that some tools are more age appropriate than others (nylon knives are recommended for ages 5 and up), but explore online; you’re sure to find something that your toddler will love using! Mmmm, what chef doesn’t like to taste what they’re cooking along the way? It’s just good practice, right? This is actually a great opportunity to teach your child when it is safe to taste something raw, and when it is not. It will also teach them that they have to use different spoons to do the tasting, due to cleanliness and hygiene. It’s never too early to get your child into healthy habits, and by taste testing, they will also tend to be more adventurous when it comes to eating overall. I try to teach my little ones to not take themselves too seriously. So dab some icing on their nose, or toss some powder up in the air. Play some music while you cook, or even have a small and special apron made just for them to wear (I am also a huge fan of chef hats). Your child will be excited to step into the kitchen with you, and by having lots of fun, you’ll be making a lifetime of memories. As a child, one of the fondest times I spent with my mother and grandmother was in the kitchen. And as a mom, I hope that both my daughter and son will look back someday and feel the same. It’s also really important to me that my kids eat as healthy as possible—something I’ve tried to do since they were both babies—and being able to prepare meals with them makes this even easier! 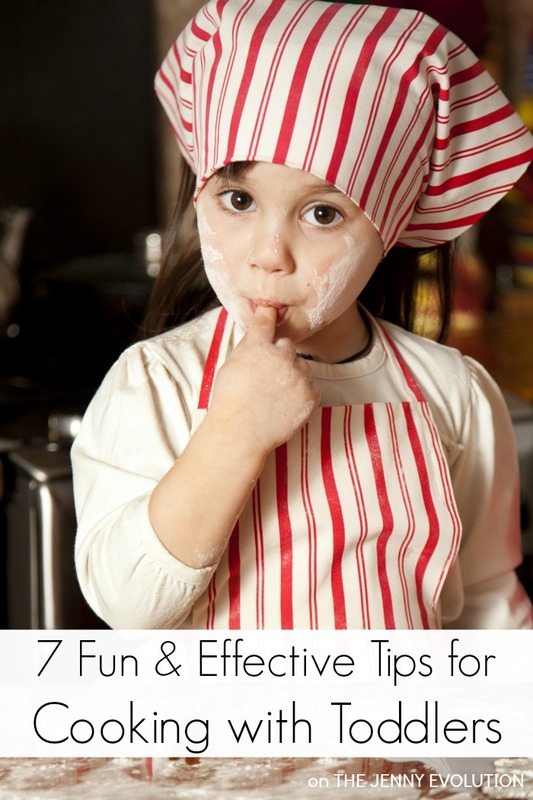 So consider these seven simple tips for a fun, healthy, and successful cooking activity in the kitchen. Kate Trout is the author behind Maternity Glow, A New Mom’s Guide to Figuring it All Out. She’s a coffee addict, wine drinker, and cheese lover. Oh, and she’s also Mom to the two cutest little kids. And here are some of my favorite aprons for kids! Thanks so much for letting me contribute, Jennifer! My daughter is 2 and I try to let her help! She helps pour ingredients into bowls and stirs a little bit before she gets bored. My hope is that I can include her more often and encourage her to try new foods, because this child is INCREDIBLY picky! Getting your kiddo into the kitchen is a great way to help a child who is a picky eater. I know having a picky eater can be extremely frustrating — I actually have two posts with some great tips too! Setting out the ingredients is such a key component, couldn’t agree more. Turning your back for a second, even to grab a spoon is just asking for disaster in my house! In the end though, cooking with my kids makes for great memories. We’ll deal with the mess. Great tips! All 3 of my kids enjoy helping me in the kitchen. One thing they liked to help with early on was homemade pizza. Thanks for linking up with the Everything Kids pin & link party this week. We love having our kids help in the kitchen, even when they were toddlers. It is amazing how well they can do things and what they learn from it if we only give them a chance. We have found that Montessori places offer a lot of cooking utensils for younger kids that make it easier for them to do cooking tasks. Sharing with my followers!! Thanks for linking up with Inspire Me Monday. Have a blessed weekend!!! Thanks for sharing. And you’re absolutely right about a Montessori approach 🙂 We have fine motor challenges in our house, so we focus on what they can participate in. But if it was up to my boys, we’d do DIY pizzas every night! My boys love to help me cook. I love it too … usually. But sometimes I just want to get something done quickly, and that’s when I have to remember to have lots of patience. Thanks for sharing this at Turn it Up Tuesday. Cooking with toddlers are a lot of fun. They are so innocent and cute. This is so good. I have cooked with my grandson who is now age 7 since he was about 2 or 3. We always make some kind of holiday treats together. His sister is just about 2 and we let her in on the fun for our Easter treats. Great suggestions that I know are true from experience. I have a post on my blog about our making Dipped Easter Eggs last week and I had everything ready to go ahead of time. Love the products you suggested. Tweeted & Pinned. Thanks, Cathy! With my boys, I started with DIY pizza… which is still their favorite! Thanks for sharing the tips! Your blog is very interesting and useful. My kids love cooking as well.